Novi Sad is a slow paced city with a considerable number of cultural heritage. As a second biggest city in Serbia it the capital of the province of Vojvodina. Today, Novi Sad is a wonderful university city on the Danube River, famous for it's IT energy. In the last couple of years it has become a real IT center of Serbia with thousand engineers, programmers, software developers, coders and other people related to this industry. A lot of startups and IT communities are growing here. Gatherings like meetups and workshops have become a part of our everyday life, places where we exchange knowledge and socialize. Zrenjanin or Petrovgrad is a city located in the eastern part of Vojvodina, Serbia. Thanks to the Technical Faculty “Mihajlo Pupin”, a lot of IT companies have emerged there and the city tends to become a real IT centar. Our company is one of the co-founders of ICT Klaster in Zrenjanin, who has a mission to put Zrenjanin in top cities in IT industries in Serbia with excellent conditions for education of IT experts and growing IT companies. we would like to give you all necessary information on how to get to Novi Sad and all things you can do while you are there. All roads lead to the city center, where the wide pedestrian zone offers something for everyone. 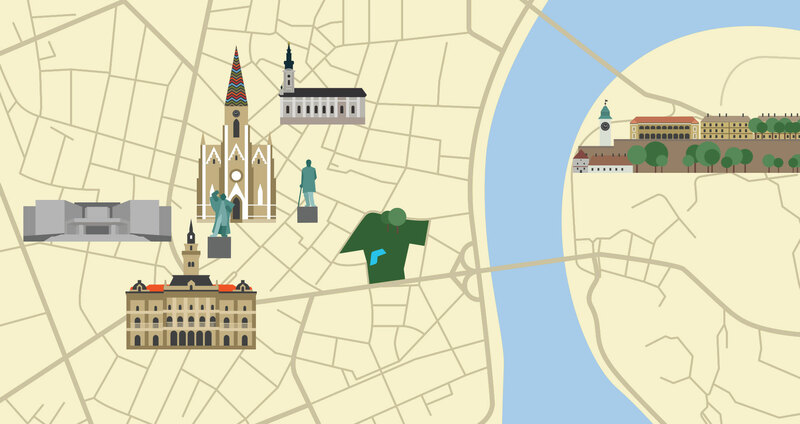 The heart of the old town features almost all must-see attractions in Novi Sad. Traditional pastry and ice-cream shops should be one of your first stops. The Liberty Square has been the stage for most significant events, whether cultural or political. It is also the usual rendezvous point and the main place for feeding pigeons. The square is dominated by two buildings facing one another: City Hall and the Name of Mary Roman Catholic Church known as the Cathedral. A monument to Svetozar Miletic, Novi Sad mayor and a champion of political rights of the Serbs in the 19th century occupies the centre of the square. From there, the pedestrian zone further stretches to Zmaj Jovina Street, the main promenade and the commercial centre of the town. The street is lined with numerous open-terrace cafes and pastry shops. The street ends with the building of the Bishop's Palace, with the Cathedral Church right behind. The corner of Zmaj Jovina and Dunavska streets is the location of the oldest preserved house in Novi Sad (1720) known as "At the White Lion's", which nowadays houses the Irish Pub. Dunavska street, also packed with shops and cafes, leads towards the Danube Park and the Danube river. At the beginning of the street, you can see one of the pockmarks on the town face - the cannonball which remained buried in the building exterior walls (where it landed during the 1849 shelling of the town). The official language is Serbian. However, English is widely spoken at hotels, restaurants and shops. Almost everyone involved in hosting you during your stay speaks at least one foreign language (English, German, French...), but if you try to use Serbian words in everyday conversation your effort will be welcomed with sympathy.